This is a question we get asked a lot. Resin driveway – relatively new option? the simple answer is no. I found this thread on the internet whilst researching our competitors (as you do). Just from the discussions online and comments it is clear to see how confusing information is available. Resin is a highly versatile product and has been in use for a number of years. If you look at the dates on this forum you will be able to answer the question resin driveways – relatively new option – as these alone date back to 2010. “We’ve got an ugly concrete driveway in front of our house, and for various reasons it isn’t practical at the moment to dig it all up and lay a new one. “You can DIY this. If the existing concrete is sound, then its just a matter of scrapping off any loose stuff, filling any dips or holes and then coating. “You may get at least 10-15 years out of it, may be much more, as it depends on the prevalent weather that the drive gets, and the sun breaking down the resin bond. Good drainage is a must. Another problem for drives, is that cars tend to be driven in the same place, and wheels turned in the same spot, and so particular areas may get more wear and degrade sooner. But that’s not to say that as a whole, the surface wont last long. Some true facts but also some misconceptions. How do you distinguish? Can you be confident that a resin driveway – relatively new option – is installed correctly? Have a look around our website, lots of information for you to peruse and even more important it is free to talk! Whatever your thoughts it is a more cost effective option than block paving. It it a lot speedier to install than block paving. 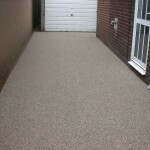 A resin driveway path or patio has anti slip properties not offered with imprinted concrete. Derbyshire, Nottinghamshire, Leicestershire and Yorkshire all within easy distance. Free quotes and honest answers. Chesterfield, Ollerton, Southwell, Clipstone – we can show you resin bonded gravel and resin bonded stone works we have completed in these areas. Resin bonded paths and resin bonded patios . Concrete, tarmac or imprinted concrete we can resurface and complete in most cases within a day. This entry was posted on Tuesday, June 24th, 2014 at 6:57 pm	and is filed under Chesterfield, Concrete, Derbyshire, Diary of a Mansfield Resin Driveway Company, Driveways, Imprinted Concrete, Latest News, Leicestershire, Mansfield, Nottingham, Nottinghamshire, Paths, Patios, resin drives, Tarmac and Asphalt, Testimonials, Yorkshire. You can follow any responses to this entry through the RSS 2.0 feed. Both comments and pings are currently closed.